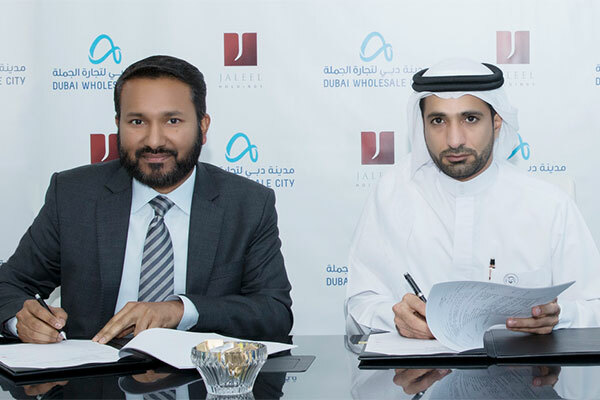 Dubai Wholesale City (DWSC) has announced that Jaleel Holdings, a top (FMCG) wholesaler, will construct a cash and carry facility with an investment value of Dh100 million ($27.2 million) in the fully integrated wholesale hub. Spanning an area of 300,000 sq ft, the premises will include a fully integrated state-of-art direct sale warehouse accommodating more than 250 employees, as well as a flagship store, storage and cooling facilities and manpower accommodation in the DWSC labour villages. The agreement was signed on the sidelines of DWSC’s participation in Gulfood 2018, in the presence of Abdulla Belhoul, CEO of Dubai Wholesale City, Saud Abu Al-Shawareb, COO of Dubai Industrial Park, Sameer K Mohammad, managing director of Jaleel Holdings, and senior management teams from the entities. Belhoul said: “Dubai Wholesale City offers a comprehensive, modern, and well-integrated infrastructure and facilities that optimizes the production and distribution of products. We remain committed to accelerating the development of the trade and manufacturing sectors in Dubai and the wider UAE, and helping our business partners build and grow their businesses. Sameer Mohammed said: "We are pleased to partner with Dubai Wholesale City and believe that this new facility will help us to expand our presence in the region and strengthen our status as a pioneer in food trading. Jaleel Holdings is already one of the largest FMCG wholesale companies in the region, with a number of locations across the UAE. Its new location at DWCS will become its biggest facility.